I am not usually a big believer in push presents, however I will say I think it’s a fun idea. While I don’t believe I need some expensive gift for carrying our child, I enjoy that someone thought it was worthwhile to reward moms who have, let’s be honest, not been exactly comfortable for 9 months. I have put together a list of some push presents I would love to have. How cute are these bangles? I love that these could be personalized with the baby’s initial or name. And oh yes, this is from the J Crew Factory. Gotta mix up the price points people. I love all of J Crew’s fun jewelry. I think one can never, ever, have too many statement necklaces. Flowers are always a good choice for your lady. Have you guys heard of Victory Blooms? I found her on Instagram and cannot get over how insanely talented she is. I would die if she was my local florist- her creations are that amazing. Seriously check her out @victoryblooms! I have wanted a good DSLR for so long. However, I still can’t decide which one so I keep putting it off. Cannon or Nikon- who can choose?! It’s ok to have a dream purchase on your wish list amiright?! I love vintage diamond rings. My mom has a few bands that are just gorgeous. Over the years I would love to create an interesting stack. Maybe even with some mixed metals- rose gold would be very cool. 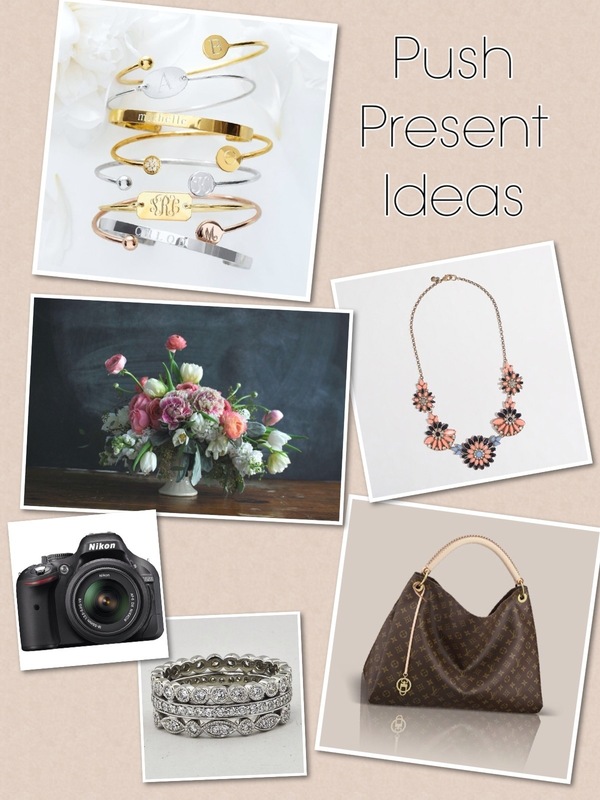 And people, just because this is a list of “push presents” doesn’t mean you can’t use it for Mother’s Day. That is right around the corner! Did you get a push prezzie when you gave birth? If you did what was it- if not what would you ask for?